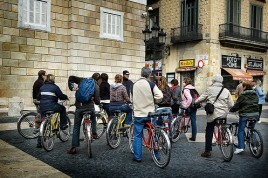 Barcelona is one of the world’s best cities to tour by bike due to its hidden streets and flat surfaces! See what barcelona has to offer including: Paseo Colom, the Beach, Monumental: The bullfighting ring, Sagrada Familia, Arc de Triomf, Parc Ciutadella, Cathedral and Barri Gòtic (Just to name a few!). Bike rental and a highly knowledgable tour guide are provided. Why not make a day of it and add lunch and drinks with a private bike tour instead!